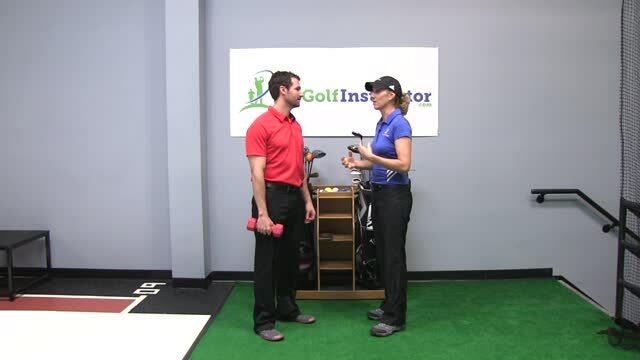 Description: External Shoulder Rotations are a great exercise to target the rotator-cuff muscles which are a common area of injury for golfers. There are hoards of students that come to the lesson tee each year complaining about rotator problems. This exercise will work other muscles of the shoulder as well. Strong shoulders are important for stability and power in the swing. Grab a dumbbell that you can easily control and maintain good form with throughout the exercise. It is important to never use too much weight as that will result in poor form and sometimes injuries. Lay on your side either on the floor, on a bench or on a pad. Use the hand that you are not using to perform the exercise to support your head or support yourself on the bench. Bend your arm (the one with the dumbbell) and rest your elbow against your side. Face your palm down and have your forearm run parallel to the ground. Raise your hand up as far as it can go. Raise up on the count of 1 and slowly lower back down to the count of 3. Perform 3 sets of 8-10 repetitions on each side and gradually increase weight when possible.